It can be hard to keep track of fall ballot issues, thanks mostly to our state’s Taxpayer Bill of Rights, or TABOR, amendment. That amendment, passed in 1992, has a lot of fine print, but mostly it limits spending and taxation for every taxing agency in the state, from the Colorado Legislature to the smallest cemetery district. All of those agencies have to go to voters for just about any tax question. That’s probably a good thing, but it makes ballots cumbersome, and it can be easy to miss important issues. 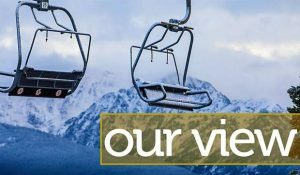 This year’s ballot has a pair of those issues in the town of Minturn’s Ballot Issue 2A, on the ballot’s second page, and Colorado Mountain College’s Issue 7D, at the bottom of Page 3. • Minturn’s request is for an additional tax of 4 percent, levied on construction materials used in town. The requirements of TABOR compelled the town to state that the measure could raise $500,000 in the first year — “and whatever additional amounts are raised annually thereafter” — but that’s optimistic. If the town had imposed a use tax in 2017, it would have raised about $250,000. The tax would be imposed on any amount above $10,000 for the materials used in construction projects. It’s a minimal additional tax in the big picture, since contractors can waive city and county sales taxes if they purchase materials in Avon, Grand Junction or Denver. The ballot measure states that funds raised will be used to create a capital improvement fund for the chronically cash-strapped town. That fund can be used for projects ranging from street repairs to adding sidewalks. It’s a fairly modest request now, but there are potential developments on the horizon that could greatly benefit the town. This is worthy of a “yes” vote. • Colorado Mountain College is following the lead of the fire districts in Eagle and Gypsum and asking voters to increase tax rates in the six-county district. That increase won’t raise any more revenue but will allow the college to maintain the funding taxpayers now provide. The tax rate increase is needed because the 1982 Gallagher Amendment to the state constitution requires decreases in tax rates to ensure that residential property taxes make up no more than 45 percent of the state’s collections. The college does great work over a large area. Cutting property tax revenue will require the school to raise tuition and fees to maintain services. This is well worth a “yes” vote. • Then there’s the town of Avon’s Ballot Issue 2B. This measure asks voters to impose a new tax of $3 per pack on cigarettes and an additional 40 percent sales tax on cigarettes and other tobacco products. Since the town earlier this year approved an ordinance raising the age at which tobacco products can be purchased to 21, the tax is another tool intended to discourage smoking. The ballot language tells voters the town could raise up to $600,000 per year from the taxes, far more than the town will lose in state funding by raising the tobacco-purchase age. Discouraging tobacco use — by either cigarette or vape sticks — is all well and good, but this seems like a feel-good measure. While people 18 and older will no longer be able to buy tobacco products in town, there are stores within easy walking distance of Battle Mountain High School that continue to sell those items. Those sales also wouldn’t be subject to the town’s tax. If passed, the convenience store in Eagle-Vail will also certainly get a good bit of the business the town is working so hard to discourage. We can’t support this proposal, although it will probably pass due to the feel-good factor. But this measure won’t bring any tangible benefits to town residents.